For the past hundred years Samsonite have been establishing their brand as the number one destination for superior travel bags, luggage, and accessories. If you’re looking for any luggage purchase with an innovative design that uses the latest technological advancements, Samsonite is the place to look. Just taking a singular look at this Andante 22-inch Wheeled Duffel we already get a durable and compact carry-on with u-shaped opening and plenty of visible packing space; a professional business look with equally classy colors to spice up your lifestyle on the go – and that’s just from a glance.  During this Samsonite duffle bag review we’ll delve deeper into this particular Samsonite bag, explaining all the things which make it great compared to other bags, and even things which we think this Samsonite piece has missed the mark on (although there are very few). Versatility must have been the word they had in mind when they first dreamt up this design, because not only does it lend itself as a very lightweight flexible carry on, but it also has the capacity and stretch to fit at least 2 weeks of clothing (backups for when that checked bag gets lost by your airline). This larger than expected capacity is created by an ingenious narrow top (while the suitcase is laying flat) that zippers open in a u-shape to give access to a deep attached drop-bottom – for all your heavy items, like boots – and a roomy top with some extra extension to fit all your clothes. Additionally, this Samsonite duffle bag is designed to meet most national and international size restrictions, and even if they do tag it at the gate (because overhead compartments are full) it shouldn’t result in an extra charge. 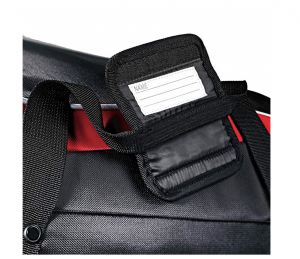 Fitting with dual haul handles that velcro together in the center, as well as a telescopic handle with an ergonomic design, this bag was crafted to assist any traveler whether young, pregnant, or elderly. Anyone can pull this bag out of the overhead with ease, or even wrangle it off a carousel with little difficulty. Put very simply, this compact bag gives you easy access to all your travel essentials while you’re on the move. At 22-inches long this Samsonite duffle bag is the largest carry-on size almost any national or international airline will accept, and there may be times when the overhead bins are full that you have to check your bag at the gate – check with the airline though, because this shouldn’t result in any extra charges. At this size the bag offers you around 35-45 liters of space, which is easily enough room for clothing that will last up to 2 weeks (and maybe a little longer, depending on how you pack). The main area of storage is inside the U-shaped top opening and allows for immediate access straight to the drop bottom base (great for all your heavy-duty coats, boots, and other bulky gear). Above this is the central duffel – although there is no divider between the drop bottom and the duffel (they are one piece – and it gives you the best space for clothing, makeup (put this in a bag because there are no interior organizer pockets), belts, and books. The top duffel even has a little stretch for fitting more things in, just make sure you can still zipper and lift it when you’re done. Also remember that while airlines typically only look at the size of your carry-on, they do have an imposed limit of around 30-40 pounds. For extra storage, this bag also offers a side zippered pocket which does give you some extra pockets for organizing your travel essentials; the telescopic handle also has its own zippered storage compartment. Samsonite’s lightweight design features a top carry handle as well as a push-button telescopic handle which zippers away when you’re done wheeling around or you’re putting your suitcase in the overhead. Now, although this handle has a decreased durability (more on this below), its surprisingly easily retractable and offers great maneuverability once extended; fully extended it locks in place, and it never jiggles or dislodges while you’re on the move. 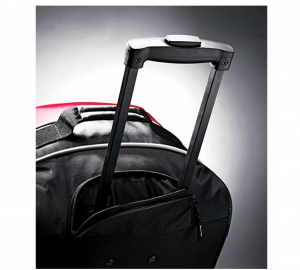 Side handles allow you to carry your suitcase up the stairs with ease, and even couple in the middle with high strength velcro. The side zippered organizer pocket offers pockets for writing instruments, cellular devices, PDA’s, and other accessories; a great place for your travel papers! The in-line skate wheels (which are already stronger than spinner wheels) utilize SmoothRoller technology which offers steel spring suspension along the flexing arm of the wheel to absorb jolting and vibration from hard unpaved surfaces; these wheels can handle almost any terrain and will provide smooth transport. Samsonite promises light weight products for the business professional who’s constantly traveling place to place and meeting to meeting; this Samsonite duffle bag is no different! Unpacked it weighs an impressive 5.07 pounds, which is only around 10% of the standard 50-pound imposed limit for most airlines. That means you have a whopping 45 pounds of weight you can pack before you possibly incur any extra fees. Depending on what and how you pack, you’ll easily be able to avoid overweighing your bag. For this bag, the best way to distribute weight is by placing all your heaviest and bulkiest luggage at the bottom of the duffel inside the rigid drop bottom compartment. Lighter things near the top and pressed into the u-shaped duffel opening with heavier objects at the bottom will keep your suitcase from flopping over while standing upright, and will also put less strain on your back and legs while hauling your travel load around. 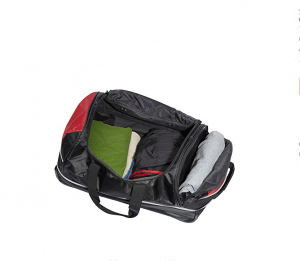 Made from polyester materials, this soft-shell Samsonite duffle bag is going to be less durable than other bags which incorporate cotton canvas designs or designs using nylon. However, the denier rating for this polyester is high enough to ensure resistance against damage from minor drops, scrapes, and weather phenomena. This bag is very water resistant, though not water proof; it should do fine through most puddles and walks through rain, but if you check this bag during a storm and it sits outside on an uncovered trolley before being loaded, its possible you could end up with some damp clothing. The drop bottom portion of this bag offers more durability than the top duffel, this is because it has ridged supports which use some nylon materials; this section also has an inner lining which offers better water protection for your valuables. The top handle and side haul handles are made from thick webbing that is very durable, unfortunately the telescopic handle uses neoprene rather than aluminum and it has been reported to have a rather shoddy design. 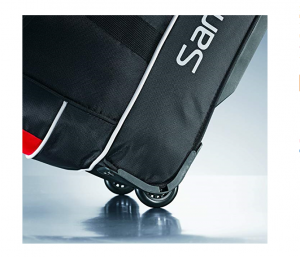 In-line skate wheels are screwed into the suitcase (which is much better and stronger than if they were riveted), and they offer added strength over bumpy terrain as well as increased traction. 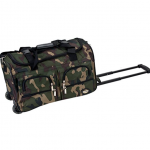 This wheeled duffel is intended as more of a business-style duffel for professionals on the go. It’s rather sleek for a duffel with a drop bottom and has a stylish black handle along with webbing top and side haul handles. 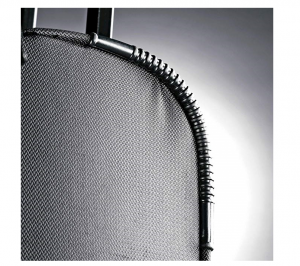 All zippers can be brought together for locking capability, and each feature pull tabs so that breaking a zipper is less likely and unzipping your suitcase in the dark is much easier. For a carry-on item the upper pouch can run rather bulky and overstuffed depending on the amount you’ve packed, but its style is still compatible with the overhead compartments listed for American airlines, United, Jet Blue, Southwest, and others! 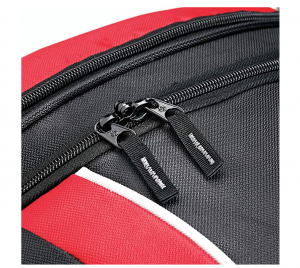 This Samsonite bag comes in three different color schemes: grey/lime, black/red, and black/grey. Black grey is easily the most serious color for a business traveler, but it’s our opinion that any black/red or grey/lime bag of this type is less likely to get lost or mixed up with another wheeled duffel. Additionally, we also find these colors rather sporty. 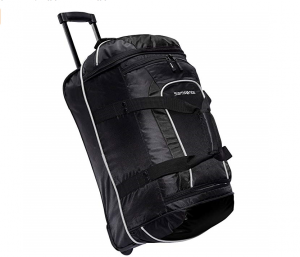 Final dimensions for this Samsonite duffle bag are 22 x 12.5 x 12.0 inches with enough packing space for around 35-40 liters (around 2 weeks of clothing). This bag easily meets the 22-inch limit for carry-on luggage, but depending on how bulky your packing job turns out there’s always a chance your airline attendants might have you check your bag at the gate. Fully upright with the handle extended, this bag is 41 inches tall, though the handle can latch at a position of 32 inches. You could check this bag if you wanted to, but based on current airline standards it meets all the qualifiers for a carry-on suitcase. 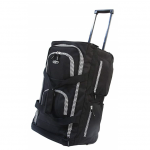 If you’re going on a quick business trip and don’t have the time or need to pack a checked bag, this 22-inch wheeled duffel is a great choice for your needs. This Samsonite duffle bag comes with a great 3-year warranty that will cover the repairs or replacements of any parts, as well as covers fixups on rips and tears so long as they are the fault of a manufacturing or airline error and not the fault of a careless owner. Usually you can contact Samsonite for a luggage consultation and tell them the issue you’ve been having, then typically all shipping costs to their repair facility are paid out of pocket; any repairs or replacements are covered by Samsonite as well as return shipping. 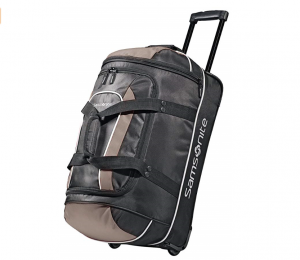 The Samsonite 22-inch wheeled duffel is a sporty looking bag designed with increased storage for the business professional away on long trips. 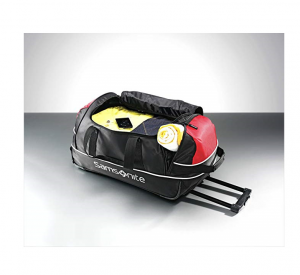 It uses an innovative design for added durability of the wheels, handles, and drop-bottom storage space; though it is worth noting it still uses lower-grade polyester fabric. For travel purposes it classifies as a carry-on suitcase, and unpacked its weight is only 10% of the total 50-pound international weight limit. With this suitcase short trips will be a breeze and you’ll never have to pay extra fees for a checked bag. Drop bottom for heavy and bulky packing. 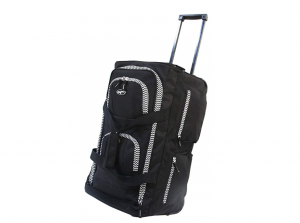 Lightweight design with plenty of storage capacity. Largest carry-on size with enough room for 1-2 weeks of clothing. Wheels use SmoothRoller technology for added strength and maneuverability on all surfaces. Polyester materials are weaker than cotton canvas or nylon. Attendants may have you check this bag at the gate if it’s too overpacked.